Yesterday C.J. Mahaney let the world know via Twitter that he is now a member of the Advisory Board of Speak for the Unborn. I find it ironic that Speak for the Unborn utilizes Proverbs 31:8-9 on their logo; this is the same passage I have included on many of my emails to various individuals I have written urging them to not speak at Mahaney’s run-away church plant in Louisville, KY, or to quit selling C.J. Mahaney’s books because of his involvement in a conspiracy to cover-up the sexual abuse of children in the church he pastored, as well as other Sovereign Grace Churches. The sordid details of this sexual abuse scandal can be found on Brent Detwiler’s blog. Below is the vision statement of Speak for the Unborn. I am pro-life and do not doubt that Speak for the Unborn is a good organization with a noble cause. However I must question the wisdom and discernment of whoever thought it was a good idea to place C.J. Mahaney on the Advisory Board. Advisory Board of Speak For the Unborn. As I was checking out the website of Speak for the Unborn I found a clue as to who may have been influential in getting Mahaney a slot on the Advisory Board. I ran across this banner – I assume 9Marx is financially supporting Speak for the Unborn. Could it be that the “good old boy” network is alive and well? 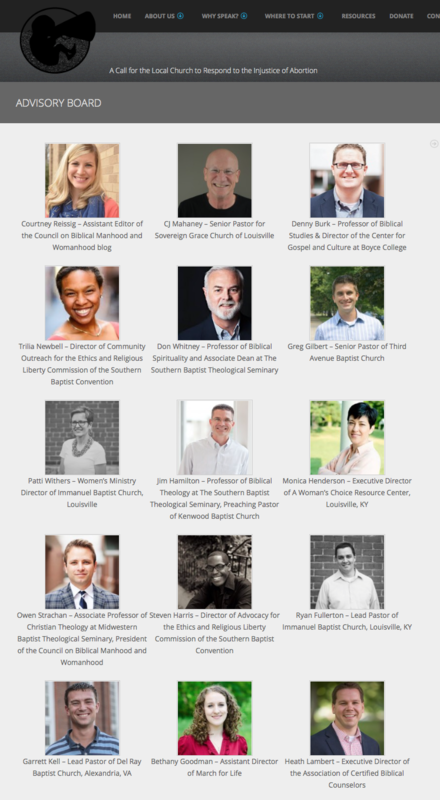 Could Mahaney’s good friend, Mark Dever, be attempting to restore Mahaney to his former celebrity status among the gospel glitterati by slowly allowing him to regain some semblance of integrity through serving on the Advisory Board of Speak for the Unborn? Andrew King is the director of Speak for the Unborn and apparently he made the selections for the Advisory Board. King is on staff at Southern Baptist Theological Seminary (SBTS). 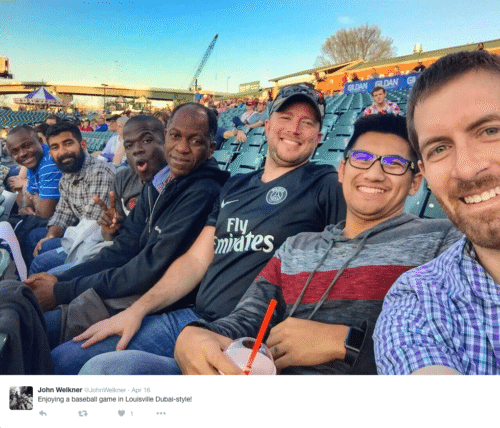 Albert Mohler is a good friend of C.J. Mahaney. 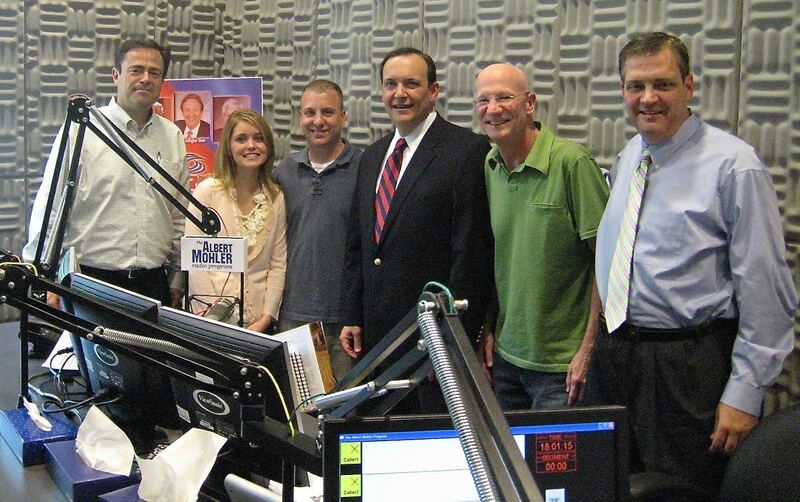 Mohler also happens to be president of SBTS. Mahaney has donated in excess of $100,000 of his own money and $100,000 of Sovereign Grace Ministries money to SBTS. Perhaps Mohler exercised some influence on the selection of C.J. Mahaney to the advisory board? What I have trouble understanding is how anyone could think Mahaney would be a good choice for the Advisory Board of this ministry. What are they thinking – the guy covers up sexual abuse of children in his church so therefore he would be a great choice to protect unborn children in the womb? Remember the story of Charlie Llewllyn? Read the story in detail on Brent Detwiler’s blog here. The quick version is Charlie Llewellyn reportedly was physically and sexually abusing his children. A housekeeper reported the abuse to Covenant Life Pastors. The pastors did not report the abuse to law enforcement, but instead alerted Llewllyn to the fact that his housekeeper ratted him out. The housekeeper was fired, the abuse grew worse and Charlie Llewllyn sent the Mahaney, Ricucci and Layman families to the Kiawah Islands in South Carolina on an expensive vacation. He covered the costs. I could add many more horrific accounts of sexual abuse which occurred under Mahaney’s watch, but it belabors my point. 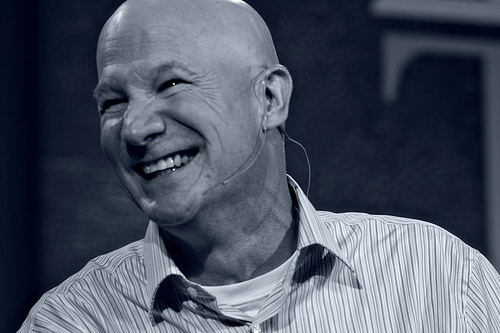 Did Mahaney know about the sexual abuse occurring on his watch and choose to cover it up? Mahaney says he did not. Others, including lawyers for the defendants in the civil suit say say he did. After studying the facts of this case it would, in my opinion, be very tough to believe Mahaney’s claim. The bottom line is that C.J. Mahaney is a terrible choice for an Advisory Board member of a ministry whose task is to protect unborn children. He has shown he had no concern for children in his church, so why does anyone believe he would have any concern for unborn children? I have submitted the email below and would urge you to do the same. Here is the link to the page. I am not hopeful that Mahaney will be removed from the Advisory Board. I would hope a Christian organization would do the right thing in this case. My experience is that people and organizations are influenced by those with money and power, us little guys are generally ignored unless our complaints become so numerous they can’t afford to ignore us. So please write! So I guess this means that you believe one side of the story – even though its been thrown out of court for its dubious believability? The courts, judges, etc have evaluated these claims and found them unsubstantiated and yet you believe the accusers? How can that be justice? Please know, this is an honest, sincere question, not an attack of any kind. I have been following this for many years and wondering where it will end up. Hello, thanks for your comment. I don’t perceive it as an attack, simply an unfortunate ramification of the lies C.J. Mahaney and his family and friends have been telling people for years. As someone who has actively advocated against the cover-up of sexual abuse at Covenant Life Church for more than 5 years, and lives within a few miles of the Church, I can assure you that I am familiar with both sides of the story. At this point, one side is stating facts while the other is telling lies. 1) The civil lawsuit was dismissed based entirely on technicalities, not the merits of its more than 140 allegations of Mahaney et al’s conspiracy to cover up child sexual abuse for decades. None of the defendants, including C.J. Mahaney, claimed they were innocent of any of the allegations of conspiring to cover up sexual abuse in the lawsuit. Instead they wanted the lawsuit dismissed based on technicalities, such as their belief that the First Amendment gives clergy the legal right to cover up sexual abuse. C.J. Mahaney has also been unwilling to explain how he can claim to believe in protecting children out of one side of his mouth while arguing that he has the constitutional right to cover up their sexual abuse out of the other. 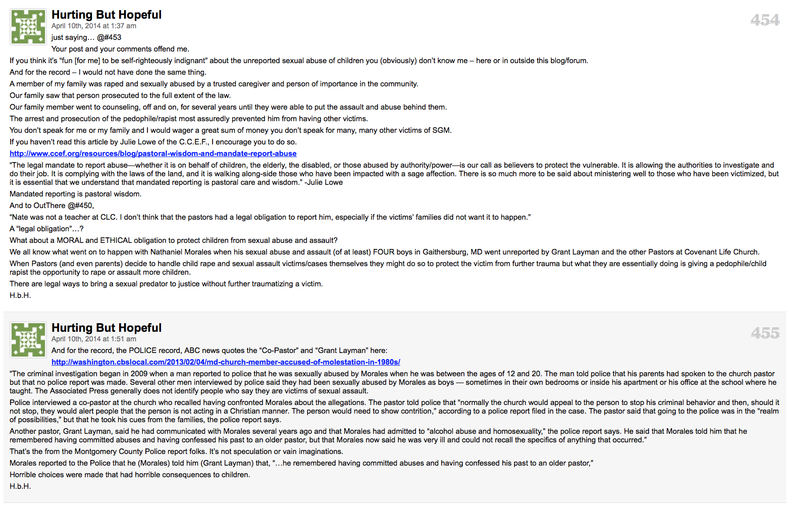 To this day, SGM has no comprehensive policy respecting reporting sexual abuse to the police or other authorities as required by law, which does not bolster their claim to care about the victims of sexual abuse they’ve helped create. SGM/CLC/Mahaney’s lawyers also claimed that the suit should be thrown out because the statute of limitations for the victims had expired and there was a jurisdiction issue. Those were the only two reasons the lawsuit was thrown out. Thus, your claim that allegations in the suit were found to be unsubstantiated is simply untrue. 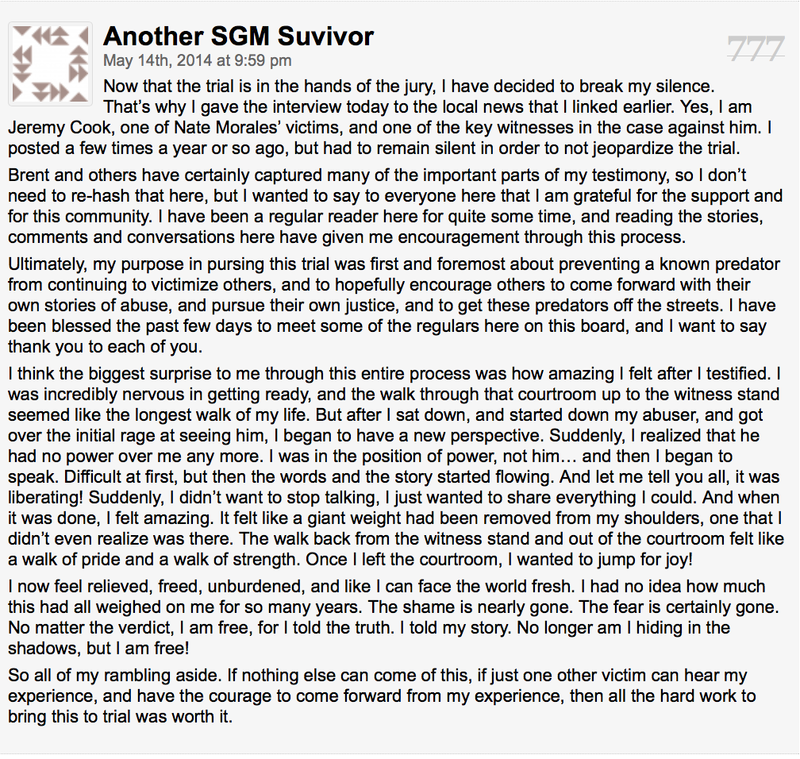 No judge or jury was ever given the opportunity to evaluate them because SGM got the suit dismissed on technicalities. Further, in a criminal case that resulted in several convictions last May, Grant Layman, C.J. 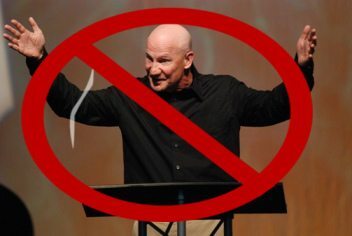 Mahaney’s brother-in-law and fellow long-time Covenant Life Church Pastor, swore under oath that all of its Pastors, in 2007, obstructed justice by not reporting the allegations against and confessions of (he told the Pastors he was molesting kids) Nathaniel Morales, a long-time youth leader at CLC. http://www.brentdetwiler.com/sgm-pastors-admit-not-reporti/ to the police. To my knowledge, none of the implicated defendants, including C.J. Mahaney, have contested Pastor Grant Layman’s sworn testimony that they collectively conspired to cover up child sexual abuse in 2007. In addition, after years of slandering victims and lying by saying he never covered up abuse, long-time CLC Pastor, Joshua Harris, finally confessed to the Washington Post that Grant Layman’s sworn testimony was true and that he and other Pastors conspired to cover up child sexual abuse. He didn’t offer his victims any apology; he simply made specious excuses for his behavior. As for where this will end up, another lawsuit against SGM and its franchise Churches is expected to be filed in Virginia very soon. In this case, some of defendants claims are not barred by a jurisdiction issue or a statute of limitations issue, so SGM and Mahaney are much less likely to succeed in having their lawsuit thrown out based on technicalities. There also appear to be several criminal investigations under way regarding CLC’s cover up of sexual abuse, although the police cannot tell us very much that subject now. I hope that C.J. Mahaney and the other defendants, who have covered up many other instances of child sexual abuse besides the one pertaining to the illegal cover up in 2007, end up in prison where they belong and are forced to compensate the sexually abused children they sold out for money. In a broader context, covering up pedophilia appears to be a big problem in the Evangelical world today. Thus, I predict it will go through the same crisis the Catholic Church endured 15 years ago. Also, please see the following YouTube video that further explains Covenant Life Church’s life and ongoing history of covering up child sexual abuse. I have been following this for many years and wondering where it will end up. Several of the claims in the lawsuit were backed up by criminal convictions before the lawsuit was even filed. Thus there is no scenario in which Mahaney, CLC, or SGM is innocent of wrong doing. I am a little surprised that someone interested in fairness, who has been following this issue for years, appears not to have read any of the legal documents pertaining to the case. Hey Buddy!, I found this information for you: "C.J. Mahaney a wise choice to protect the unborn?". Here is the website link: https://thouarttheman.org/2015/08/12/c-j-mahaney-a-wise-choice-to-protect-the-unborn/. Thank you.